Hydropower contributed to about 86% of Uganda’s total electricity generation in 2016 (UBOS, 2016). With more than 2000 MW of investments in the pipeline, within the next decade (Platts 2016), this technology is expected to play a critical role in Uganda’s transition to a higher consumption level in the multi-tier framework for measuring energy access (MEMD 2015). Competition for water sources is a common challenge among its users. In this case, hydropower infrastructure is not an exception, and water allocation is frequently prioritized to supply domestic and agriculture sectors. With Uganda’s population expected to double by 2050 compared to 2015 levels (UNDESA 2017), the competition for water among the different sectors is only expected to increase. In addition to this, climatic variables, like precipitation and temperature, introduce a high variability in the availability of surface water (Maslin and Austin 2012). Hence, before locking down on major infrastructure decisions as is the case of large-scale hydropower plants (>100 MW), it is prudent to take into consideration the cross-sectorial dependencies, trade-offs, and potential impacts of climate variability. This study develops a methodology based on the established Climate, Land, Energy and Water strategies (CLEWs) framework (Howells et al. 2013) to assess the vulnerability of the electricity sector to climate change by also considering minimum environmental flows in major Ugandan rivers. 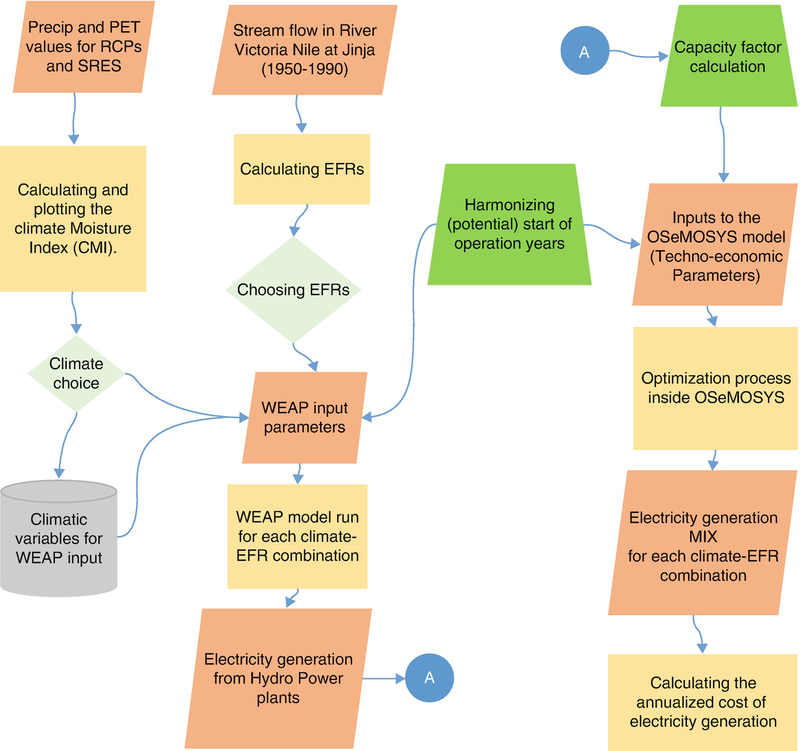 This assessment utilizes the cost of electricity generation as an indicative metric to compare conditions of different hydropower output, in light of changing climates and hypothetical environmental flow constraints. It concludes that irrespective of the climate, if key environmental services have to be maintained, there will be a reduction in hydropower generation in the country, and proper adaptation measures need to be taken to avoid disruptions in power supply. With only 20% of the country electrified (IEA 2017), Uganda has a significant challenge moving forward to meet electricity access targets of the 2030 Agenda for Sustainable Development (UN 2015). About 87% of Uganda’s Total Primary Energy Consumption (TPEC) comes from traditional biomass (MEMD 2014), with more than 90% of the households using firewood and charcoal for daily cooking and heating purposes. As the country transitions to use cleaner forms of energy, more people are expected to switch to using electricity for their daily needs, according to Uganda’s second National Development Plan (NDP II 2015). In addition to higher household electricity consumption, ambitious irrigation plans (MWE 2011) and increased household water consumption (MWE 2013) are expected to increase electricity demand in the country. NDP II (2015) takes into consideration the need for higher electricity generation capacity in the country to meet this expected increase in demand. Among the available sources of electricity generation in Uganda, hydropower, with its high potential (MEMD 2017), can become the backbone of the country’s economic development. Hydropower plants produce a significant share (86%) of electricity generated in the country (UBOS 2016a); they constitute about 77% of the total installed generation capacity in 2016 (MEMD 2017). With more than 2000 MW of planned capacity expansion in the pipeline (Platts 2016), hydropower is expected to play a substantial role in Uganda moving to a higher tier in the World Bank’s Multi-Tier Framework for Measuring Energy Access (ESMAP 2007; MEMD 2015). However, the source of water for these existing and forthcoming large hydropower plants (>100 MW) is also used and often prioritized for other sectors, namely, agriculture and domestic water supply. Less than 1% of the cultivatable land in Uganda is irrigated (MWE 2011). With an expected, at least, fivefold increase in the irrigated agricultural land by 2035 (compared to 2011 level) (MWE 2011) to ensure self-sufficiency and food security, water use in the agricultural sector is expected to increase, resulting in prioritized water allocation. In 2010, about 28% of water used for irrigation was from surface water sources (UBOS 2011), and, according to the irrigation master plan, this share is expected to increase as more cultivatable land near surface water sources is expected to be brought under irrigation. As per capita purchasing power increases, water consumption in households is also expected to rise until it reaches the phase, where the consumption levels reach the flat section of the environmental Kuznets curve (Katz 2015), thus adding to the competition. It must be noted that different sections of the Ugandan society will fit at varying points on the curve, based on their GDP per capita. In parallel to the discussion on competition for the same sources of water supply, investments for improving and scaling up energy and water infrastructure have impacts on the ecosystem: starting from altering river flows and changing the land cover to involuntary displacement/resettlement of communities, to name a few (Roy 1999). Large hydropower plants often require big dams (for plants with reservoirs) or a diversion of flow from the main river (for some run-of-river-type plants). Such infrastructure buildup may result in water flow reduction and diversion in rivers, leading to potentially irreversible damage to the local ecosystem (Anderson et al. 2015). To address this issue, a discussion was stimulated at the annual river symposium in Brisbane (2007), with the aim to maintain minimum flow rates in rivers, irrespective of future diversions and infrastructure buildup. This discussion led to the Brisbane Declaration (2007) which stipulates that “[e]nvironmental flows describe the quantity, timing, and quality of water flows required to sustain freshwater and estuarine ecosystems and the human livelihoods and well-being that depend on these ecosystems.” The declaration encourages river commissions across the world to make sure new and large infrastructure projects do not create any detrimental impacts on river flows. Expansion planning for investments in the power sector, without considering the interlinkages and cross-sectoral impacts on land use, water resource systems, and the ecosystem as a whole, can result in lopsided policies, as illustrated by Howells et al. (2013) for the case of Mauritius. The study, using a multi-model ensemble, explores the options of using bagasse to produce ethanol instead of using it traditionally in combined heat and power (CHP) plants to reduce greenhouse gas (GHG) emissions. Rasul (2016) describes the need for a nexus approach to meet the water and energy targets of the United Nations Sustainable Developments Goals (SDGs) from a South Asian perspective. FAO (2014) discuss the water-energy-food nexus in the context of the Sustainable Energy for All (SE4ALL) Initiative. Thus, multi-sectoral interdependencies should be taken into consideration while planning long-term investments in energy infrastructure. Fluctuations in energy demand due to changes in atmospheric temperature (Staffell and Pfenninger 2018) and variations in season and spatial water availabilities. Fluctuations in energy supply: erratic changes in climatic variables like precipitation and temperature can result in unexpected irregularities in electricity generation from hydropower and inland, water-cooled thermal power plants. Similar effects are noticeable in electricity generation from wind and solar power plants (van Vliet et al. 2016). Production of liquid biofuels is directly related to crop production and hence water consumption; climate affects the availability of the water for crops (Tirado et al. 2010). Impact on energy infrastructure: sudden and extreme weather events could lead to infrastructure damage (damage of hydropower spillways due to flash floods, damage to electricity transmission infrastructure). For countries with a large share of hydropower in the electricity generation mix, like Uganda, the stakes are high when drier weather conditions persist. De Lucena et al. (2010) describe the impacts of climate variability in Brazil, where hydropower plants constitute more than 80% of the installed electricity generation capacity; they suggest diversifying the mix to reduce damages. Conway et al. (2017) demonstrate that the case in many sub-Saharan African countries with a significant share of hydropower is no different; they correlate a reduction in GDP to lower hydropower production due to drought in Kenya and Zambia. Lower availability of water in the Zambezi River has led to frequent blackouts in Zimbabwe and Zambia (NBC News 2015), resulting in a reduction of industrial outputs (Hamududu and Killingtveit 2016). Variability in hydropower generation due to climate change, resulting in fluctuations in the cost of electricity generation, might have far-reaching impacts on the economy, which are only exacerbated by the high share of hydropower in the generation mix. The focus of this chapter is to assess the vulnerability of a hydro-dominated electric power system, such as in Uganda, to climate change. There have been recent studies that focus on analyzing the impact of climate change on different sectors in Uganda: agriculture, water resources, and energy, to name a few. Twagiramaria et al. (2018) discuss the impact of climate on agricultural practices in Ugandan highlands and suggest some adaptation measures to climate proof the crop production. Taylor et al. (2014) discuss the impact of climate change on water supply for domestic and agricultural purposes but do not consider the country’s irrigation master plan and the possible impact of hydropower on the water resources. Van Vliet et al. (2016) discuss the impacts of climate change on the power sector on a global scale, using a hydrological-electricity modeling framework; this study is extensive in its assessment of hydropower and climate scenarios on a continental and global scale, but does not capture the detail required to provide insights on a country level. The recent electricity sector master plan of the Eastern African Power Pool (EAPP) discusses the impact of climate on electricity infrastructure but does not take into consideration the water and land-use sectors and national plans for irrigation (EAPP master plan 2016). Nevertheless, the EAPP master plan is an excellent source for technological and fuel price projections, which are critical for evaluating the resilience of the power sector. The purpose of this study is to assess the vulnerability of Uganda’s electricity sector to climate change, taking into consideration the interlinkages between energy, land use, water resources, and ecosystem services. This study complements and builds on the “Climate, Land, Energy and Water strategies” (CLEWs) framework developed by Howells et al. (2013). Since hydropower and electricity sector expansion planning is the focus, a long-term electricity sector planning tool is used in this study. The Open Source energy MOdelling SYStem (OSeMOSYS), a least-cost, optimization-based, long-term, energy systems model, is chosen owing to its simplicity and open-source code which allows for easy modifications to suit the modeling needs (Howells et al. 2011). In addition to OSeMOSYS, a water balance model having the capability to represent land use and take into consideration long-term climate variability is used to model water supply and demand components in the analysis. The Water Evaluation And Planning (WEAP) system is chosen for this purpose. The capability of WEAP models to represent energy, water, and land-use sectors in a user-friendly manner is utilized in this study. Different methods exist to link and iterate data between models. In this assessment, we soft link the two models to preserve the technical detail in the different sectors that are represented in each of them, along with the possibility to exchange data between them. The study uses the cost of electricity generation in the country as an indicative metric to assess the climatic impacts. The Methods and Tools section of the chapter briefly presents the different tools, the model structure, and the information flow. Key results from selected scenarios are explored in the Results and Discussion section. The chapter concludes with a summary of key outcomes in the Conclusion section and suggests future steps and improvements to the model. The work presented in this chapter is based on the soft linking of two modeling frameworks: one model for infrastructure expansion in the electricity sector and one that deals with the management of water resource systems in Uganda also accounting for land-use changes. The following sections summarize these tools, the underlying assumptions and data used in this exercise. This section details the methods used to represent water resources management in Uganda. 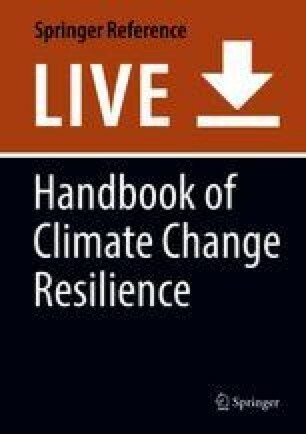 It includes a subsection describing the method used to select climate scenarios for this study, followed by a section on maintaining minimum environmental flows in rivers so as to preserve/safeguard ecosystem services. Table 1 summarizes the existing, under-construction, and planned hydropower capacity in Uganda in 2016 (Platts 2016); the large hydropower plants are highlighted in the table. Bujagali, Nalubaale, and Kiira, the existing large hydropower plants, constitute about 70% of total installed electricity generation capacity in Uganda. These hydropower plants are located at the outlet of Lake Victoria, close to the city of Jinja (see Fig. 1). Although 45% of Lake Victoria’s surface area lies inside Ugandan borders, more than 80% of the catchment area that drains into it lies outside Uganda, in Tanzania, Kenya, Burundi, and Rwanda (Prado et al. 1991). Therefore, the management of water resources in the catchments that fall outside Ugandan borders plus the natural availability of water dictated by the water balance in Lake Victoria play a significant role in defining the flow of the Victoria Nile River that reaches the hydropower plants located over its course. As illustrated in Fig. 1, all future, large, hydropower plants are situated downstream of existing hydropower plants on Victoria Nile River, between Lake Victoria and Lake Albert. All of these have capacity over 100 MW. Catchments around Victoria Nile is where a significant share of cultivatable land is expected to be brought under irrigation (MWE 2011). Hence, the catchments that drain into rivers inside Ugandan borders needed to be represented in detail to capture the different systems that compete for the same sources of water supply. 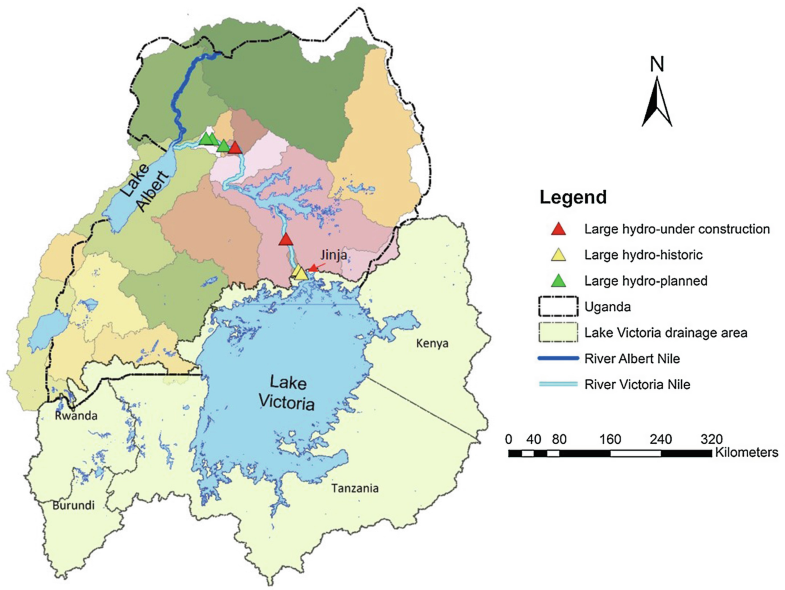 A water balance of the catchments that drain into Lake Victoria and ones that drain into rivers inside Uganda is developed individually in the Water Evaluation And Planning (WEAP) system, a widely used integrated water management framework, which has been fine-tuned over the past 20 years (Yates et al. 2005). Since the focus of this study is to assess the vulnerability of the power system inside Uganda including the other relevant sectors, a greater spatial detail is used to represent the catchments that drain into Ugandan rivers (like Victoria Nile River) than for the catchments that drain into Lake Victoria (that lie in Tanzania, Kenya, Burundi, and Rwanda). A lumped catchment-type water balance model is developed for the catchments that drain into Lake Victoria. The catchments are represented by two hydrological units, representing nonirrigated and irrigated areas, and are used to represent areas of different land covers within the catchment. The nonirrigated node is further disaggregated into grassland, forestland, wetland, cultivated land, water bodies, and built-up land. The irrigated land represents solely the agricultural area for cultivation of irrigated crops, with the latter being specific to the region covered by the catchment. Cultivated agricultural land in the Victoria Nile catchments is predominantly rainfed, and there is a significant push to irrigate and increase crop yield. It is expected that irrigation water withdrawals in the region will increase in the future, resulting in varying runoff into Lake Victoria, hence the need to differentiate irrigated and nonirrigated irrigated areas. The lumped catchments that drain into Lake Victoria are represented in Fig. 1 under a single color. The developed WEAP models have a monthly temporal resolution, and the model period extends until 2050. Similar to the lumped catchment approach followed to represent the drainage basin of Lake Victoria, each catchment inside the Ugandan border is classified into irrigated and nonirrigated area nodes. The nodes in each catchment are classified based on the latest land cover maps obtained from the Regional Centre for Mapping Resources For Development (RCMRD 2014). The share of the irrigated area in the total cultivated agricultural land in Uganda is less than 1% (Wanyama Joshua et al. 2017). An irrigation master plan was developed by the Ministry of Water and Environment (MWE 2011); it discusses the need to increase the share of land under irrigation and lays out a plan for it. According to the plan, about 70% and 20% of the irrigable land, which are close and far off from surface water sources, respectively, will be irrigated by 2035. This study utilizes district-specific irrigation expansion from the master plan as base data. Along with land use, also other water uses in the agricultural sector were represented in the water model. The large hydropower plants in Uganda are represented in the model with site-specific information. In the Victoria Nile catchments, covered in this study, these correspond to a total existing installed capacity of 630 MW, which represent 70% of the total existing electricity generation capacity of the country in 2016. The small or mini hydropower plants account for about 67.5 MW of current installed electricity generation capacity in the country, and the planned additions amount to about 380 MW (MEMD 2017). Due to non-availability of site-specific power plant information, we considered only a few of these small power plants (in the WEAP model) for which we had all the technical specifications. All these small-scale plants are run-of-the-river (ROR) type and do not have any reservoir capacity; hence they are characterized by seasonal variation in electricity generation. However, the entire hydropower capacity is represented in the energy systems model, both large and smaller infrastructures, as it is critical to represent all the available generation capacity in the country for long-term infrastructure planning. In the water model, this is expected to create little impact as they have low turbine flows and do not have any reservoir, thus not affecting the flow in the river to a significant degree. It must be taken into consideration that the water balance model prioritizes allocation of water for agricultural and domestic household consumption over hydropower generation. The model also considers the losses present in transporting water from the source to demand centers. Moreover, all the scenarios including the baseline consider the same irrigation expansion plan and water allocation priorities for household water use. These two competing uses of water are considered in the same manner across all the scenarios to capture the climatic impacts on the power system effectively. Figure 2 illustrates the calibration that is obtained for the flow out of Lake Victoria for the years 1952–1990. The blue and orange lines refer to the modeled and observed actual outflows from Lake Victoria, respectively, measured at Jinja. The historical climatic information used in the calibration process is obtained from Li et al. (2010). Climatic data is a critical component of any water resource assessment (Silberstein 2006); hence, it is of paramount importance to use site-specific data to model river flows representative of the natural flow pattern. However, relevant, site-specific data is not easy to obtain, especially if the information from climate data centers is not easily accessible, which is the case in this study. A global dataset of meteorological forcing variables for land surface modeling, developed by the Princeton Land Surface Hydrology Research Group, is used to define the baseline (Sheffield et al. 2006). A spatial resolution of 0.5° × 0.5° and a monthly temporal resolution are used for this study. All the 0.5° × 0.5° grid points, which fell under each of the studied catchments, were averaged to obtain one set of monthly temperature, precipitation, humidity, and wind speed data. Climatic data is used by WEAP to calculate reference evapotranspiration (ETref), while crop coefficients (KC) obtained from the Food and Agricultural Organization (FAO) (Allen et al. 1977) are used to calculate crop and land cover-specific evapotranspiration (ETC). For the reference scenario, climate data for the periods of 1951–2000 was cycled into the future, therefore assuming that the climate in 2001–2050 was similar to the period 1951–2000. For defining the climate change scenarios, we considered two categories of emission scenarios: one medium (A1B) and one high (A2), based on the Special Report on Emission Scenarios (SRES) from the IPCC’s Fourth Assessment Report (AR4) (IPCC 2007), and one medium (RCP 4.5) and one high (RCP 8.5) emission scenario based on the Representative Concentration Pathways (RCP) from the IPCC’s Fifth Assessment Report (AR5) (IPCC 2013). The Coupled Model Intercomparison Projects, CMIP3 and CMIP5, which contributed to IPCC AR4 and AR5 reports, respectively, consist of outputs from many general circulation models (GCMs), 22 from AR4 and 23 from AR5, respectively. Hence, two emission scenarios from each of the abovementioned GCMS resulted in a set of 90 climate model-emission scenario combinations. These combinations were ranked based on their Climate Moisture Index (CMI), which is an indicator related to precipitation and evapotranspiration projections and is used to rank the combinations to identify the wettest and driest scenarios (Willmott and Feddema 1992). The Climate Moisture Index (CMI) is a measure of aridity in the region. The index values vary between −1 and +1, with lower values representing conditions that are arider. A CMI value greater than zero indicates that precipitation rates are higher than potential evapotranspiration rates. CMI is often used as an indicator of crop water demand and surface runoff (Cervigni et al. 2016). A CMI value for the Nile River basin, average over the period 2010–2050, is used for this study (Boehlert et al. 2016). Figure 3 illustrates the CMI value for all the combinations. Projections of all the climatic variables for each scenario, including the baseline, are introduced into the WEAP model to estimate the surface runoff at each catchment node. With Uganda and its neighboring transboundary countries, in the Nile Basin, increasing the share of agricultural land under irrigation and the share of hydropower in their electricity generation mix, there is a high imperative to estimate and implement necessary EFRs on their shared rivers to maintain ecosystem services in the region. The Nile Basin Initiative’s “Strategy for Management of Environmental Flows in the Nile Basin” emphasizes the need to take adaptive action before locking into large energy and irrigation infrastructure (NBI 2016). Over 200 different methods exist to calculate minimum environmental flows, classified under various categories ranging from purely hydrological to holistic methodologies involving multiple parameters (Tharme 2003). For this study, five different EFR methodologies implemented in separate case studies over different hydrological regimes are considered: Smakhtin et al. (2004), Tennant (1976), Tessmann (1979), and two new methods developed by Pastor et al. (2014). The chosen 5 EFR frameworks have been validated at a local level across 11 different basins across the globe. Since the electricity sector and, especially, large hydropower plants are the prime focus, the EFRs were implemented for the section of the Victoria Nile River starting from Lake Victoria’s outlet until the point where it reaches Lake Albert. Note that all the existing and planned hydropower infrastructure is situated in this section of the river. Historical monthly flow information at Jinja, a gauging station located near the start of Victoria Nile, for the period 1950–1990 is used to calculate the EFRs. Figures 4 and 5 illustrate a flow duration curve (FDC) showing the Q50 and Q90 levels and the absolute flow, respectively, from the Jinja gauge. Q50 and Q90 (flow quantile) markers correspond to the river flow that has exceeded 50 and 90 percent of the time, respectively, between 1952 and 1990. Table 2 details different methods and the respective criteria used to arrive at the EFRs (Pastor et al. 2014). The river flows are classified into low, intermediate, and high depending on the type of EFR method as shown in Table 2. EFRs calculated using all the methods mentioned above for Victoria Nile River are shown in Fig. 6. 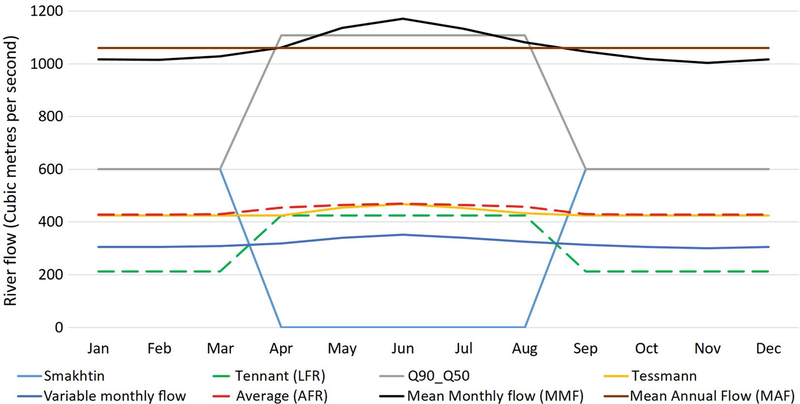 Also presented are the mean monthly flow (MMF) for the period 1950–1990 and the average value that resulted from the application of the different EFR methods. As shown in Fig. 6, on average and for the period of measurements, the MMF and MAF for Victoria Nile River at Jinja (black and brown lines, respectively, on the chart) is above 1000 m3/s. The red line represents the average of the five EFRs. From the analyzed frameworks, three methods are chosen: one based on the Tennant method (LFR) to represent a low-flow requirement where a minimum flow is maintained across all the months in a year, an average of all the EFRs (AFR) to represent a high-flow requirement, and a case where there is no minimum flow requirement in the rivers (NFR). The chosen three adequately represent the spectrum of maintaining varying levels of ecosystem services. The choice is also partially guided by the fact that with rapid electrification plans in place to improve electricity access in the region, it is considered unlikely that the environmental policies will tend toward higher EFRs suggested by the Q90_Q50 method; it will render almost all the planned hydropower plants without water for electricity generation. The EFRs are implemented, in the model, in all sections of Victoria Nile, where a diversion is created for the run-of-river hydropower plants. Ideally, the EFR has to be calculated for each section of the river where the power plants are located, but due to lack of available data (flow information) at each plant site, the EFR calculated for Victoria Nile at Jinja is used for the stretch of the river until Lake Albert, which is being modeled in the four successive catchments. Uganda’s latest National Development Plan (NDP) mandates to improve electricity access in the country from 14% in 2015 to 30% by 2030 (NDP II 2015). Though there has been some delay in the construction of hydropower plants mentioned in the NDP (UEGCL 2018), Uganda is expected to double its electricity generation capacity by 2020. In this study, an expansion model of Uganda’s power sector is developed using an open-source, linear, techno-economic optimization framework – OSeMOSYS (Howells et al. 2011). OSeMOSYS, written in GNU MathProg and also available in GAMS and Python (Makhorin 2008), is a dynamic, bottom-up, multi-year energy system model applying linear optimization techniques. It is used to develop pathways for medium- and long-term energy planning on national, continental, and global levels (Cervigni et al. 2016; Pinto de Moura et al. 2017; Taliotis et al. 2014, 2016). Effectively, this section explores the different assumptions considered in the reference/baseline scenario of this exercise. In the electricity system model developed for Uganda, all electricity generation options, except for large hydropower plants, are grouped based on the fuel used. 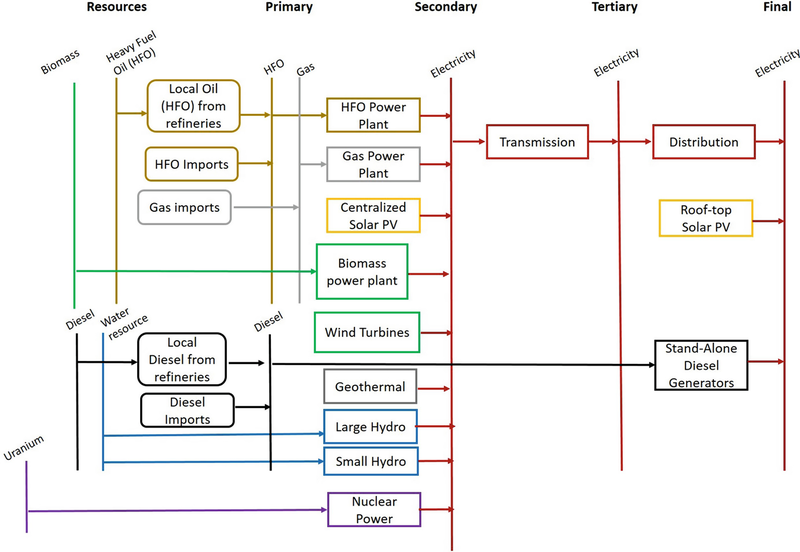 For example, all the heavy fuel oil- (HFO) based power plants are grouped into one option and represented with the same techno-economic characteristics, the same in the case for Solar PV, wind turbines, and the other technologies. Figure 7 illustrates the Reference Energy System (RES) – the schematic representation of energy flows following a bottom-up resource-to-use approach – of the Ugandan model, from the supply on the left-hand side to demand on the right-hand side. The electricity demand projections used in this exercise are obtained from an assessment carried out by (AF Consult 2015a) for the Ministry of Energy and Mineral Development (MEMD) in Uganda for the year 2015. 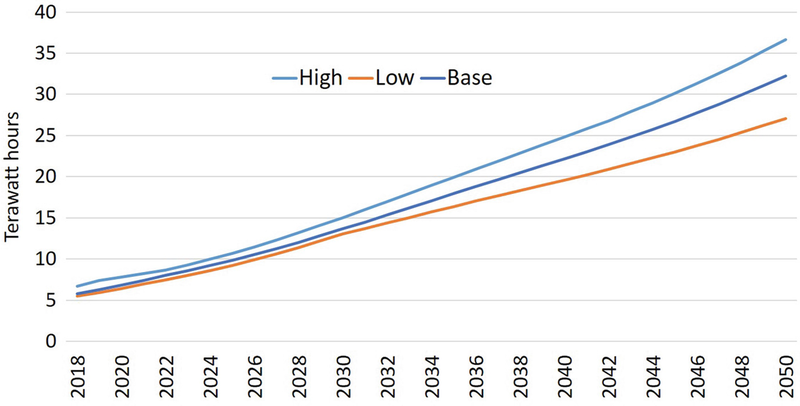 Three different demand scenarios are considered: high, low, and base as illustrated in Fig. 8. In 2050, the electricity demand in the high demand scenario is expected to be 35% and 14% higher than the low and base demand scenarios, respectively. The yearly electricity demand is classified into domestic, industrial, and commercial sectors based on the information obtained from MEMD (2017). The sectorial demand shares are kept constant until the end of the modeling period. Transmission and distribution losses in the current system are estimated based on a demand and supply balance obtained from the MEMD. For 2014, the losses were 3.6% on transmission grid and 21.3% on the distribution grid (MEMD 2015, 2017). It is assumed that until the end of the modeling period (2050), these will reduce to 2% and 5%, respectively. The techno-economic parameters for the electricity generation technologies are obtained from the latest edition of the EAPP master plan (2016) and AF Consult (2015b). The large hydropower plants have site-specific capital costs derived from the estimated total cost of the respective projects. Fossil fuel prices and their projections for this study are obtained from the EAPP master plan (2016). A discount rate of 10% is applied to the model. Although the national policies extend only up to 2040 (NDP II 2015), the model period of this analysis has been extended until 2050 since the climate scenarios analyzed as part of this assessment exhibit high variability in between 2040 and 2050, as illustrated in Fig. 10. The temporal resolution of the model is more detailed than the water management model; it has 48-year splits. Each year is split into 12-month periods; additionally, each month is classified into four dayparts (morning, day, peak, and night), this division led to 48 splits in a year. The share of electricity load falling under each of the computed time steps is calculated and input to the model. It must be mentioned that this model has a perfect foresight into the future and computes an optimal generation mix for the entire modeling period using a least-cost, optimization-based approach. The OSeMOSYS code used in this study can be accessed from the GitHub portal and corresponds to version 2017_11_08. Figure 9 illustrates the methodological flow of this assessment. The precipitation and evapotranspiration values for the different climate projections are used to calculate the CMI, which is used as a metric to choose the climate scenarios for the analysis. Climatic parameters, for the chosen climates, required as input to the WEAP model, are obtained from the CMIP databases. In parallel, historical river flows at Jinja are used to calculate minimum environmental flows based on the selected EFR frameworks. During the model development phase, the potential start dates for future power plants are harmonized between the OSeMOSYS and WEAP models. The minimum environmental flows and climate scenarios are implemented in WEAP simultaneously to estimate the maximum hydropower generation for each scenario combination. Five climate scenarios and 3 EFRs were analyzed, resulting in 15 different combinations. Each combination is explored with the water model and the power sector model. Hydropower generation from each of the large plants, as obtained from the water model runs on a monthly basis, is used to estimate capacity factors of the respective power plants, to be used in the OSeMOSYS model. However, the power pool model has a better temporal resolution; it has four splits in each month. Hence, to maintain coherence, the four-time slices of each month in the OSeMOSYS model are made to associate with the same hydro capacity factor to reflect the modality of the WEAP model. The following subsections explore key findings from this study. The impact of climate on the flow out of Lake Victoria is discussed as the hydropower generation from historical power plants is affected by it. After that, the electricity generation mix of the reference scenario is explained illustrating the generation options available in Uganda. The discussion is taken forward by analyzing the impacts of climate and enforcing minimum environmental flows on Victoria Nile in a mutually exclusive manner. The section concludes with an assessment of the combined impacts of environmental flows and changes in the climate. Figure 10 illustrates the impact of different climate projections on Lake Victoria’s outflow. It should be noted that a wet/dry climate scenario chosen based on their CMI values is only cumulatively wet/dry, but not necessarily wet/dry across all time steps of the period of the analysis. This characteristic is explained by the inter-annual and seasonal variability of Lake Victoria outflows in the modeled period. Indirectly, the outflow reflects the impact of climate on the catchments that drain into Lake Victoria and the lake’s water balance. It is interesting to observe how the reference climate differs from the cumulatively wetter and drier climates. According to the data sources, it is expected to be relatively wet in the initial years of the modeling period and becomes progressively drier toward the second half, with some wet spells toward the end. The outflow of Lake Victoria, measured at Jinja, is critical to hydropower generation, as the contribution of drainage from Victoria Nile catchments is minimal, at least for the existing power plants: Bujagali, Nalubaale, and Kiira. Hence, proper management of the lake and its drainage area is essential for higher levels of energy security in Uganda; this calls for higher levels of transboundary cooperation between Uganda, Rwanda, Burundi, Kenya, and Tanzania. Cumulative (2018–2050) hydropower generation from the three historical large hydropower plants is approximately 143 TWh for the baseline scenario (ref). The generation in the wettest (bnu45) and driest (giss85) climates are expected to be 2.6% higher and 11.6% lower, respectively, compared to the baseline. Despite analyzing three demand scenarios and running the OSeMOSYS model to generate electricity sector expansion plans for each of them, only the implications for the high demand scenario are presented in this chapter. Electricity generation mix for the reference climate scenario without considering any EFRs is illustrated in Fig. 11. The dominance of hydropower is noticeable throughout the model period. Reduction in the share of hydropower in the total generation mix can be noticed post-2030; this could be due to low flows in Victoria Nile or can also be attributed to the need for extra capacity in the power system to meet higher demand. Biomass, geothermal, and HFO-based power plants are expected to play a vital role by contributing a more significant share to the generation mix. Geothermal capacity in the country, though in its nascent stages of development, is restricted to a maximum capacity of 250 MW as in the latest electricity Master Plan of the Eastern African Power Pool (EAPP master plan 2016). Oil production from the oil fields in Lake Albert region is expected to commence in 2020, and with the East African countries sharing the cost of the pipeline, locally sourced HFO is expected to play a supporting role for the power system laden with hydropower (MEMD 2016). There is approximately 85 MW (Platts 2016) of biomass-fired power plants in the system, all of them use bagasse from the sugar industry as fuel, that are used predominantly for self-consumption by the industrial sector (sugar works) and contribute excess to the grid. With 233,170 hectares of cultivatable land planned to be irrigated by 2035 (MWE 2011), the availability of inexpensive biomass residue/bagasse available for power generation is expected to increase and play a key role to strengthen the power system. Wind and solar power are also expected to contribute a minor share (2% in 2050) to the total generation. In spite of the model considering a reduction in Solar PV and wind power costs over the modeling period, the technologies do not seem to be cost-effective to warrant higher penetration in the generation mix. Similarly, despite the availability of nuclear power options, it is not part of the cost-optimal energy mix until 2050 in the reference climate scenario with no EFR. The impact of implementing minimum environmental flows (on River Victoria Nile) on electricity generation is illustrated in Fig. 12. 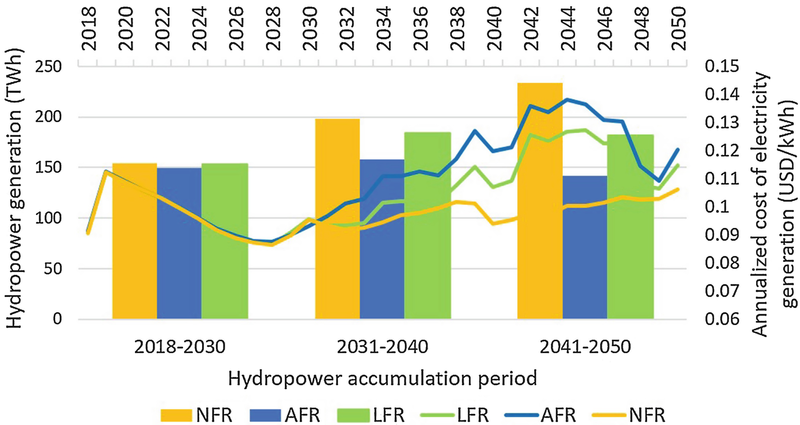 The annualized cost of electricity generation and hydropower generation in the different EFR scenarios explain the economic impacts on the power system. Hydropower generation is accumulated over three different time periods. The only induced change in the scenarios are the capacity factors of the hydropower plants taking into consideration the different EFRs; the OSeMOSYS model computes an optimal generation mix based on power plant availabilities. In the period 2030–2050, the effect of enforcing higher environmental flows on the cost of electricity can be clearly noticed. The annualized cost of electricity generation is calculated exogenously from the total expenditure (capital, fixed, and variable) on electricity infrastructure that contributes to the generation mix. It includes all the power plants – both grid-connected and stand-alone systems – transmission and distribution (T&D) infrastructure, and fuel prices. In the high EFR scenario, consumer expenditure is expected to be approximately 17% higher than the scenario with no EFR, cumulatively for the period 2018–2050, a difference corresponding to about 11 billion USD2015. It is assumed that there will not be any government subsidy in electricity pricing. Consumers are expected to pay 10% (6.5 billion USD2015) more in the low EFR scenario in comparison to the no EFR case. There is a significant similarity in the cost of electricity for the initial years (until 2027); this is because the reference climate is wet in those years, resulting in higher Victoria Nile outflows. Moreover, the hydropower plants are working at part load capacity, since the demand is not high enough for them to generate at full load. Hence, even a stricter environmental flow regulation does not affect hydropower and electricity cost. It must be taken into consideration that the results are for a model with perfect foresight. In reality, there is no perfect foresight, and a dry spell can result in higher electricity prices and can render some infrastructure redundant. The impact of climate on the power system without enforcing any minimum environmental flows is shown in Fig. 13. The cumulatively driest climate (giss85) results in higher costs compared to other climates, approximately resulting in 3.6% – 2.3 billion USD2015 – higher consumer expenditure when compared to the reference climate. Under the cumulatively wettest climate (bnu45), consumer expenditure is expected to reduce by 2.5% – 1.6 billion USD2015 – in comparison to the reference scenario. The generation mix for the different climates, without any EFR, does not exhibit significant deviations from each other except for the cumulatively driest climate, where the reduction in hydropower generation toward the end of the modeling period results in more significant fossil fuel usage and as such higher cost of electricity. However, having no restriction on the river flow for environmental and ecosystem services could result in a much more significant impact in the region under a dry climate. This being said, a wet climate could result in lesser or no damages; but, even a cumulatively wet climate could have a few dry year spells, and not maintaining minimum flows could alter critical processes like sediment trapping and recycling of soil nutrients (Kiwango et al. 2015). The effects of not maintaining minimum environmental flows in rivers span over many categories ranging from entertainment and tourism to loss of habitat for endangered species and land-use change. The stretch of Victoria Nile between Lake Victoria and Lake Kyoga is popular for white water rafting but is under threat due to the construction of Isimba dam (International Rivers 2016). Maintaining a minimum environmental flow in the rivers, irrespective of the climate, is mandatory to sustain ecosystem services. When the climate and EFRs are considered together, the impact on the cost of electricity generation is quite noticeable through out the modeling period. Two EFRs, a low and high option, were analyzed along with the five different climates. Figure 14 illustrates only the impact of introducing a high EFR. The cumulatively driest climate (giss85) is expected to cost the consumer 8.2% more than in the reference climate (ref) and the cumulatively wettest climate (bnu45) 9.6% less compared to the reference. The cost of electricity generation is similar for the reference and the two wet scenarios in the initial years until 2024, whereas the cost is significantly higher in the drier climates. 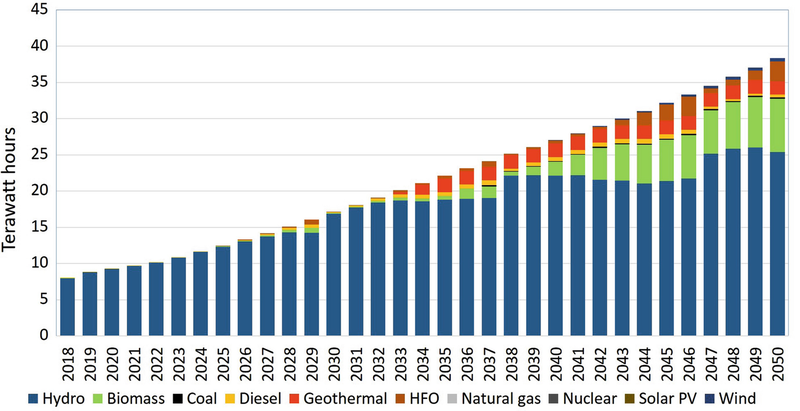 The cumulative impact of all the scenarios and their electricity generation mix can be observed in Fig. 15. For the cumulatively driest climate (giss85), high EFR scenario (AFR) is expected to cost consumers about 80 billion USD2015, between 2018 and 2050, 6 billion USD2015 more than the scenario with the Low EFR (LFR), whereas in the cumulatively wettest climate (bnu45), the AFR and LFR scenarios are expected to cost 65 billion USD2015 and 63 billion USD2015, respectively. The yellow line corresponds to the cumulative expenditure in the reference climate scenario with no EFR. It is interesting to note that nuclear power generation options are being considered only in the cumulatively drier scenarios (giss45, giss85) and only when EFRs are considered; the optimization results indicate that investments in nuclear power plants will occur toward the end of the modeling period. This situation is expected to change as the Ugandan Government is discussing with the International Atomic Energy Agency to conduct feasibility studies for the development of nuclear power plants and investigation of uranium exploration possibilities (Uganda State House 2018). 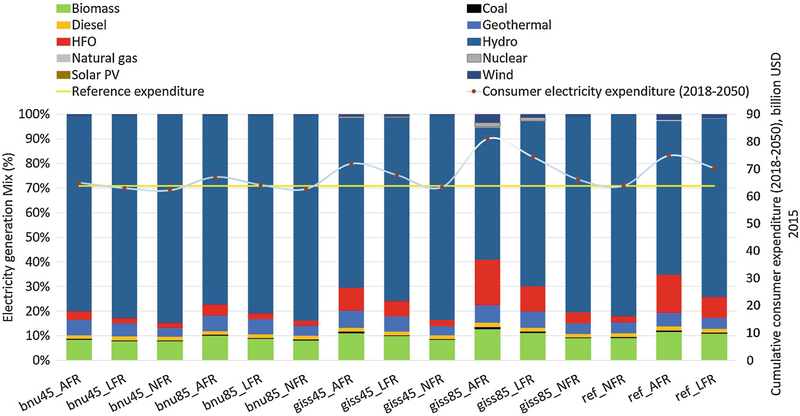 The vulnerability of electricity infrastructure, while maintaining minimum environmental flows in the rivers, is quite evident from the variations in the cost of electricity generation across the 15 different scenario combinations. In addition to the primary objective of improving electricity access in the country, Uganda aspires to be a net electricity exporter in the region by trading electricity with neighboring Kenya and Tanzania, at least to start with. If the hydro infrastructure is built without considering potential climatic changes and other competing uses, an unexpected drier year could fail to deliver on power purchase agreements; since all the large hydro facilities are the run-of-the-river type, there is no possibility to store water in reservoirs as a buffer. Uncertainty around climate change is inevitable; despite the advancements in climate science, it is difficult to assign probabilities for the climate to unfold in a particular pattern. Moreover, even if the climate is uniformly wet, this study concludes that if the environmental flows need to be maintained, a reduction in electricity generation is expected. This is assuming the technical specifications of the existing and planned hydropower infrastructure in Uganda remains the same. Whereas, from an environmental point of view, the potential long-term advantages of maintaining a minimum flow in rivers may have a value that could outweigh the impact of variations in the cost of electricity generation. However, establishing regulations to implement minimum flows is not straightforward; robust policies need to be put in place to ensure their maintenance. In countries with a large share of hydropower in their electricity generation mix, like Uganda, there is an increasing need to ensure that investments made in large infrastructure are judicious and prudent. The case of hydropower in the power system is unique because it is dependent on a resource that is shared with other sectors and is the most affected by climate patterns, among the sources of electricity generation in Uganda. Methods implemented in this study explore the climatic impacts on a hydro-dominant power system considering the allocation of water resources for maintaining environmental services while safeguarding the supply of other users such as the agricultural and household sectors. The results indicate that assuming a minimum environmental flow is maintained on Victoria Nile, irrespective of the climate, there could be periods of fluctuation in hydropower generation resulting in volatile electricity costs, though, cumulatively, the costs are lower for a wetter climate and vice versa for a drier climate. In addition to the cost of electricity generation to consumers, it is expected that a reduction in electricity generation from hydropower plants will lead to delayed payback times for power plant operators; this is of importance in Uganda, where there are large privately financed independent power plants like Bujagali (Meyer et al. 2018). Moreover, this work also contributes to expand the knowledge on the implications of introducing minimum environmental flows when planning the development of the electricity generation sector. This study does not intend to predict the cost of electricity generation in Uganda rather to gather insights regarding risks faced by the electricity system under different climate futures. It must be observed that this study does not take into consideration the sensitivities in fuel prices and final electricity demand, and various other geopolitical factors, which only indicate a higher uncertainty on the power system impacts. With that being said, numerous adaptation options could be considered. Diversifying the electricity generation mix to increase the share of non-hydro renewables like geothermal, wind, and solar technologies has the potential to offset the climatic impacts and overreliance on specific technologies. Though the National Development Plan indicates a high geothermal potential (1500 MW) (NDP II 2015) in the country, this assessment considers only candidate power plants that are either under construction or planned, according to the latest figures from the MEMD, which are lower than the NDP estimates. However, it remains interesting to wait and observe how the geothermal potential in the country will be expanded to reach its maximum potential. Biomass-based electricity could serve as a potential alternative; a recent study estimates the total theoretical potential of agricultural residues in Uganda will be 148 PJ/year (Okello et al. 2013). Assuming a conservative efficiency estimate of 10%, approximately 4 TWh of electricity demand could be met each year from only the agricultural biomass residue, not including the forest and animal residue. In addition to the technological options, some mitigative measures like interlinking the Ugandan power system to hydropower in neighboring Democratic Republic of the Congo (DRC), where the Congo Basin is expected to have low vulnerability to climate change (Cervigni et al. 2016), could be an alternative, provided the DRC develops its hydro capacity. Similarly, power system interlinkages within the EAPP might help mitigate the climate effects of basins with high vulnerability to climate change. In parallel to the electricity supply options, transmission and distribution (T&D) infrastructure is critical to improving the electricity access in Uganda. The need to establish T&D systems is all the more critical in the case of hydropower plants as the resources are far from demand centers, as in the case of Uganda. The power sector model, developed for this study, could be improved to perform a limited foresight analysis to account for myopic decision-making. This study does not quantify the indirect monetary benefits of implementing minimum environmental flows, which could potentially outweigh any increase in the cost of electricity generation.